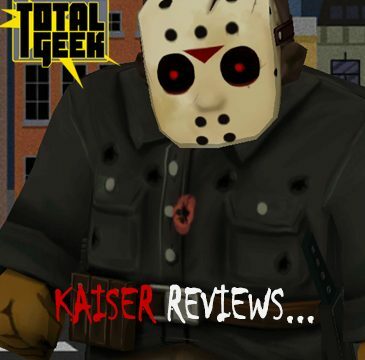 I’ve dabbled in mobile gaming off and on going back to my first flip phone I got back in the early 2000’s where I got addicted to a Lord of the Rings strategy game. 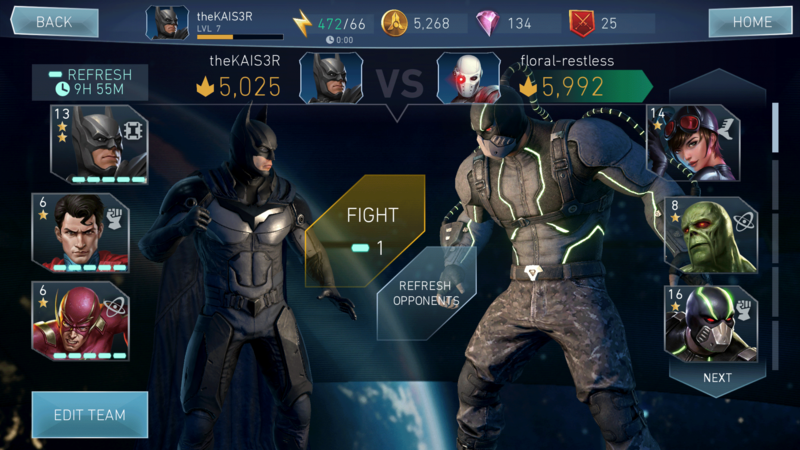 Every so often I’ll discover a game that will keep me coming back to it… After completing the PS4 version of Injustice 2, I downloaded the mobile version (Android) to sync my accounts and unlock Cyborg’s alternate skin, Grid. About 2 hours later I realized I was still playing the mobile game and had not jumped onto the PS4 to play with my new skin. Turned out the mobile version was just as engaging in its own way. 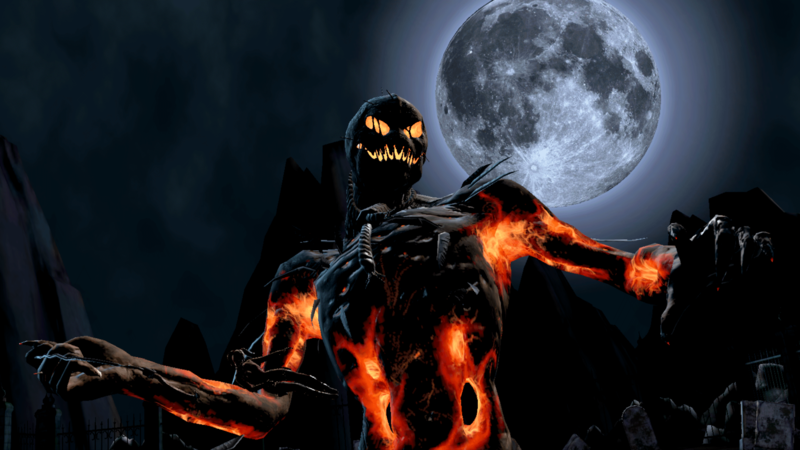 Initially I was blown away by just how damn good this looked for a Free-to-Play game. The cinematics looked every bit as detailed on my Pixel XL as they did on my PS4. The drop in quality from cinematics to actual gameplay is much greater than the console version, but also not as bad as I was expecting. You can see right away where they cut some corners. 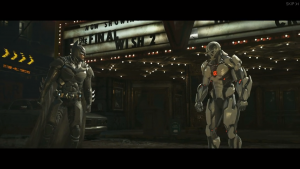 No synced facial animations to voices, Super Moves are trimmed here and there (for instance Flash only slams his opponent into a T-Rex instead of a Sphinx & T-Rex), and the extra little sizzle stuff like particle FX, dynamic lighting and environment interactions and animations are toned way down. But again, not as far down as you would expect in a mobile game. 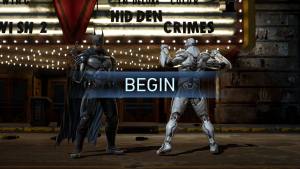 For everything that was removed however, there are new things introduced that add to the experience in ways not found on the Injustice 2 console version. Now there are fights with common thug types (Grodd’s gorilla soldiers, Arkham Inmates, etc) in addition to the super heroes. Probably the biggest core gameplay difference between the mobile and console versions, aside from controls, is your ability to create a team and switch between members at any point during the fight. 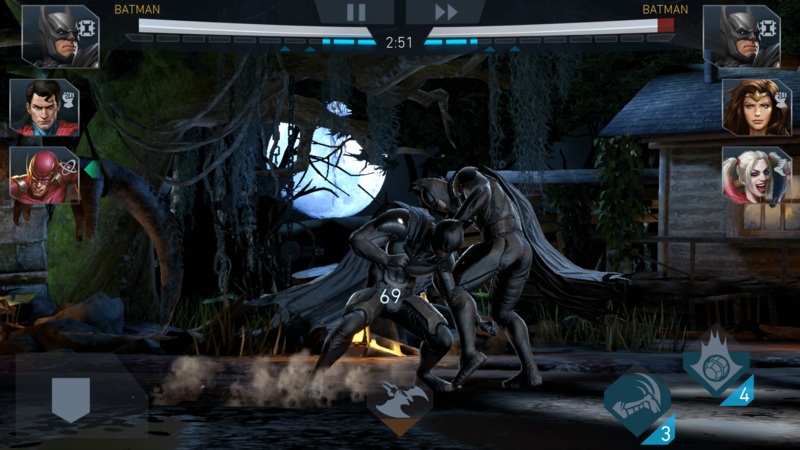 Fighting has been simplified to work more naturally on a mobile device while retaining some modicum of varied fighting styles between all of the playable characters. On-screen buttons are easy to comprehend and are spaced well enough so you don’t accidently hit ones you don’t mean too. On the lower-left is your Block, bottom-center is your Super Move and the Special Moves that you unlock and choose for each character are on the lower-right. 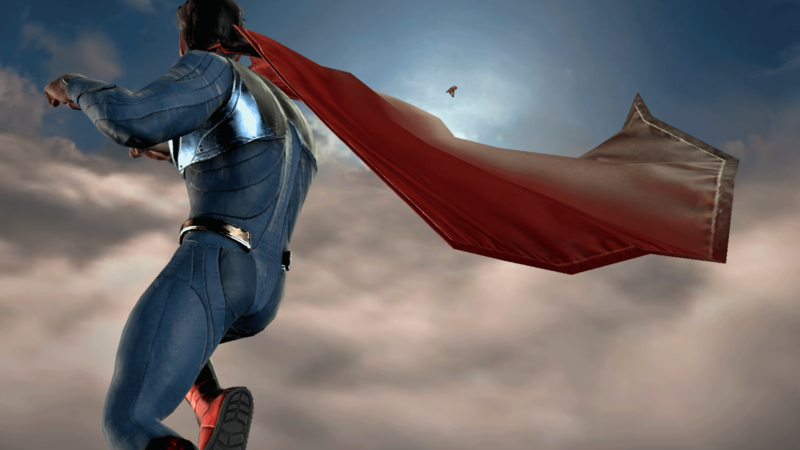 Unlike the console version, once your Super Move is powered up you do not have to make sure your distance is correct or worry that your opponent is going to block it – once you unleash your Super Move it is on like Donkey Kong. 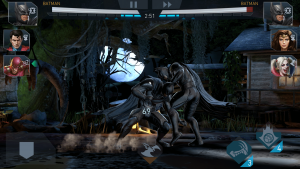 The rest of a player’s moves are unleashed by either Tapping, Swipping Up, Swipping Down, Swipping Forward, or adding a Tap immediately after any of the Swipes. 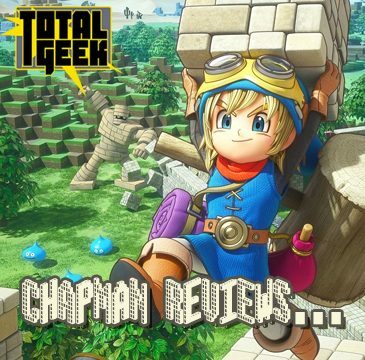 It’s a much more streamlined approach to the moveset that truly makes it able for anyone to pick up and pull off cool moves and have a chance to win. 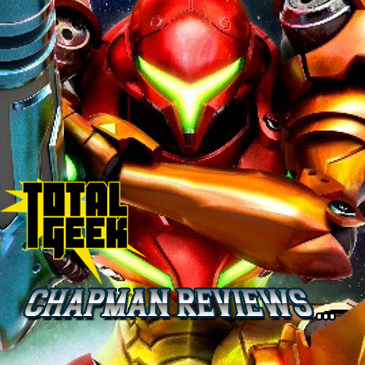 To some degree, it sometimes feels like there’s too much when you start getting into all the different collectables, how you get them and what they do and when you can use them. 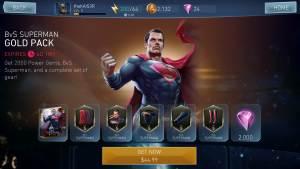 I feel Injustice 2 suffers heavily by adhering so strictly to Free-To-Play tropes. It preys on the impatient. 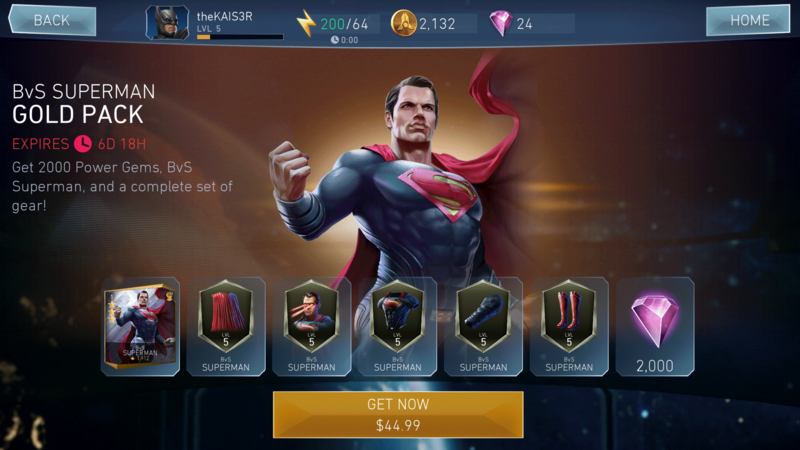 It has unrealistic prices for something as simple as unlocking a character ($44.99 for Superman in a limited time event? Really?!) 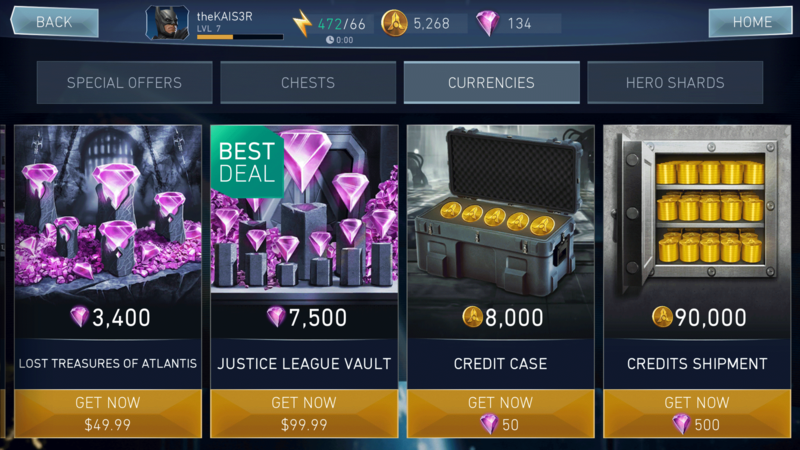 or the $99.99 crate that showers you with lots of credits that allow you to buy the better type of credits that let you buy the really cool things, but still not enough to unlock everything in the game even though you just dropped a hundred f’n dollars!!! I get it, though. A game with this much content and polish and licensed characters is not cheap to make and give away for “free”. So yeah, you prey on the impatient who are willing to pay to unlock things that they could unlock by playing (or stop playing until things recharge, etc) the game every waking moment (well, every waking moment they have the in-game energy to be allowed to play). You fish around in hopes of landing a few whales who don’t flinch at the $50, $80, $100+ purchases. Because I get that for every hundred people who pick up and play the game without ever buying anything you need that one who will spend. But for the love of all that is good on this Earth, there are better ways. Ways in which I as a consumer, geek, and gamer would be willing to drop money on a game of this quality. For instance, I’d pay $5.00 to unlock a character I really wanted. 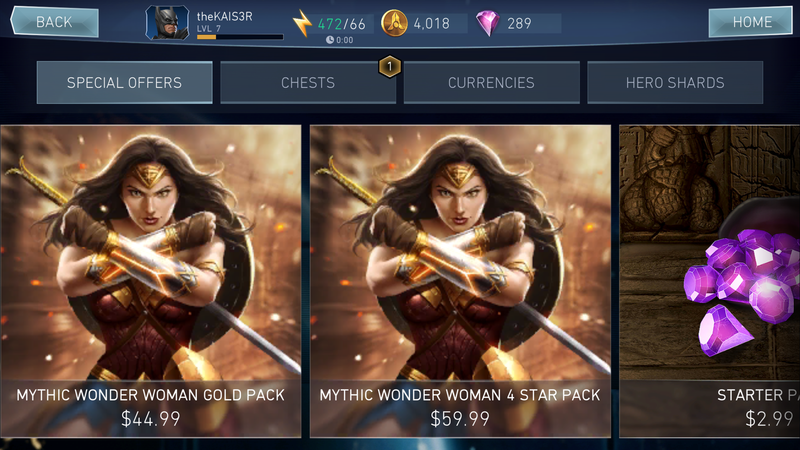 With multiple characters that I want, that could easily equal out to the purchase of a full game. 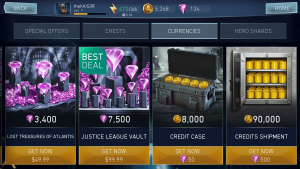 I’d love it even more, as someone who plays the mobile and the console versions, if I bought say Sub Zero on my PS4 that it would unlock or at least give a drastic discount for the character on the other version (they’re tied together, they know when you’re playing the other versions so it is possible). Enough of my rant, because when the game is working properly, I find it to be a great little mobile escape. There are plenty of modes to hop between from Story, Arena, Resource Missions, Operations and Challenges (with Leagues coming soon). You are rewarded for taking part in each of the modes as you can only get certain characters or particular rewards from certain modes. Some of them are timed which gives you that “I need to check back in and see what’s next” addiction. 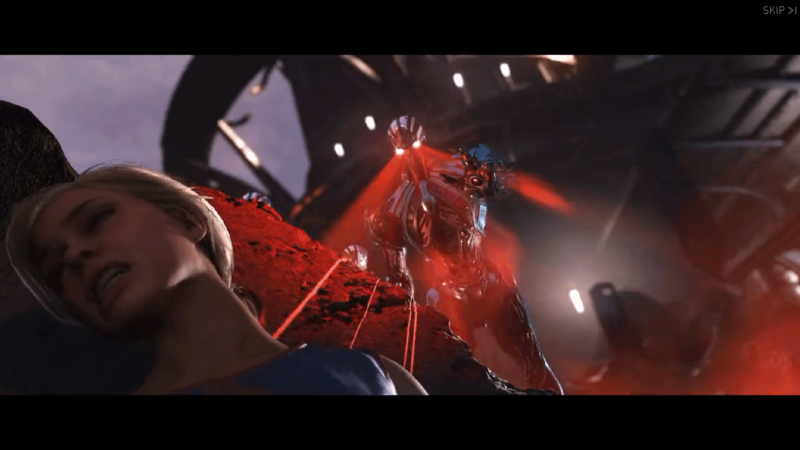 Like any game, the more you play Injustice 2, the more you unlock. I do particularly like the inclusion of the Operation Mode. Basically you send available characters away on missions. The bigger the mission, the more XP and booty they get and the longer they will be gone (and by gone, I mean you can not use them in any other mode as they are away on an Operation). So you always want to send off characters on missions when you are done playing for the day. Or lower class characters on quicker missions that you can reap their rewards when you’re done then send them out again before shutting off. 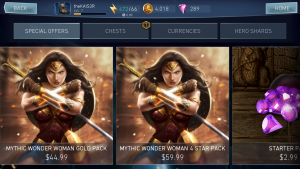 If you play Free-to-Play mobile games at all, you probably already have an understanding of what an uphill battle it is to unlock all the characters and there are a lot here, 46+ and growing (although some of those are alt versions of popular heroes like Batman and Superman). 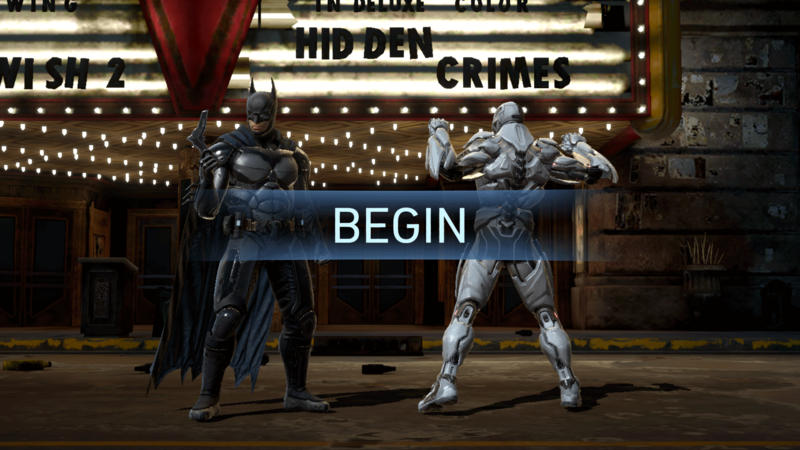 Because you’re not just trying to unlock the characters, but also level them up. Like I said, there’s maybe almost too much to do in this game, but I cannot help but keep coming back to it and chipping away at it. Slowly, my roster grows. Slowly, I’m getting powerful enough to take on new challenges. 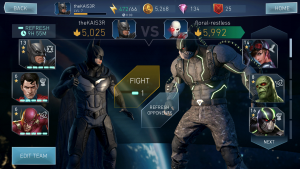 If you like the Injustice games, or just the DC roster of heroes and villains in general, Injustice 2 mobile is worth the download time and memory of your smart phone. 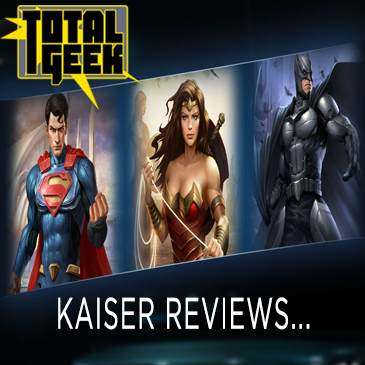 When the League option opens up, I may update this review to include a Total Geek Injustice 2 League (which I am guessing will work like the Guilds on the console) for you fellow geeks to join. Till then, I’ll still be playing.